JetBlue will stick with its grow-it-alone strategy, which is a smart move given American’s challenges and poor track record when it comes to mergers and acquisitions. JetBlue Airways Corp. has “no interest” in a merger with AMR Corp.’s bankrupt American Airlines and hasn’t received a document that would allow an exchange of confidential information between the carriers. After being identified by AMR last month as likely to get a non-disclosure agreement, JetBlue has held no talks with the larger airline about a combination, Chief Executive Dave Barger said yesterday in an interview at Bloomberg’s headquarters in New York. JetBlue at New York, JFK. Photo by Michael Gray. Barger’s comment underscored New York-based JetBlue’s aversion to the industry deal-making since 2008 that created the world’s two biggest airlines, United Continental Holdings Inc. and Delta Air Lines Inc. He said JetBlue will grow with steps such as adding flight slots at airports including Washington’s Reagan National and increasing service in San Juan, Puerto Rico. Signing a non-disclosure agreement is a first step in merger discussions. It gives prospective partners access to each other’s financial records on condition that the information not be shared. AMR sent a non-disclosure agreement last month to US Airways Group Inc., which is weighing its own takeover bid. At a July meeting of AMR’s unsecured creditors committee, Chief Executive Officer Tom Horton also identified Alaska Airlines, Frontier Airlines and Virgin America Inc. as possible merger partners, a person familiar with the situation said at the time. That would fit with Horton’s stated goal of preferring to have AMR emerge from bankruptcy as a stand-alone company and then consider mergers to broaden American’s network. While JetBlue has been regarded as a possible target for AMR, Barger’s disavowal of interest dimmed those prospects. US Airways, whose shares have more than doubled this year as it circles AMR, jumped 7.9 percent to $11.43 in New York to lead a rally among airlines. The gain was the largest since May 24. JetBlue was unchanged at the close. Michael Trevino, a spokesman for Fort Worth, Texas-based American, declined yesterday to identify any recipients of the agreements or discuss Barger’s comments. JetBlue’s growth strategy includes expanding in Boston, San Juan and Central America, said Barger, who became CEO in May 2007. The sixth-largest U.S. airline by traffic also wants to boost flights at Washington’s Reagan National airport and New York’s LaGuardia, he said. Those airports have restrictions on takeoff and landing slots, which must be purchased or traded from another airline. Adding flights outside the U.S. may require government approvals for so-called route authorities. American has figured in industry discussions about possible tie-ups because it wasn’t involved in the major deals at the end of the last decade. New York is American’s chief East Coast hub for trans-Atlantic flights, as well as JetBlue’s biggest base. The carriers have a so-called interline agreement for some New York and Boston flights that has been the subject of recent conversations, Barger said. That accord lets each airline sell tickets on specific partner flights and check bags on one itinerary, with revenue going to the flight’s operator. JetBlue travelers can book on American to 15 foreign cities from New York and Boston, while fliers to the two destinations on American jets from abroad can reach 26 U.S. cities via JetBlue. They also share flight slots in Washington and New York. 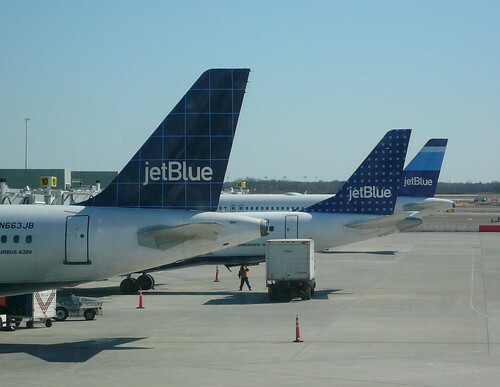 Barger said JetBlue’s network, which now stretches as far south as Colombia, is at its geographic limit because of the range of the carrier’s Airbus SAS A320 jets. Those single-aisle planes form the backbone of its fleet, bolstered by Embraer SA E190s. JetBlue hasn’t ruled out adding wide-body Airbus planes to extend flights farther into South America, he said. With assistance from Tim Catts and Trish Regan in New York. Editors: Ed Dufner, Stephen West. To contact the reporters on this story: Mary Schlangenstein in New York at maryc.s@bloomberg.net. To contact the editor responsible for this story: Ed Dufner at edufner@bloomberg.net.